← 160 "Lisa's Date with Density"
A "Vend-A-Couch" is on the wall instead. 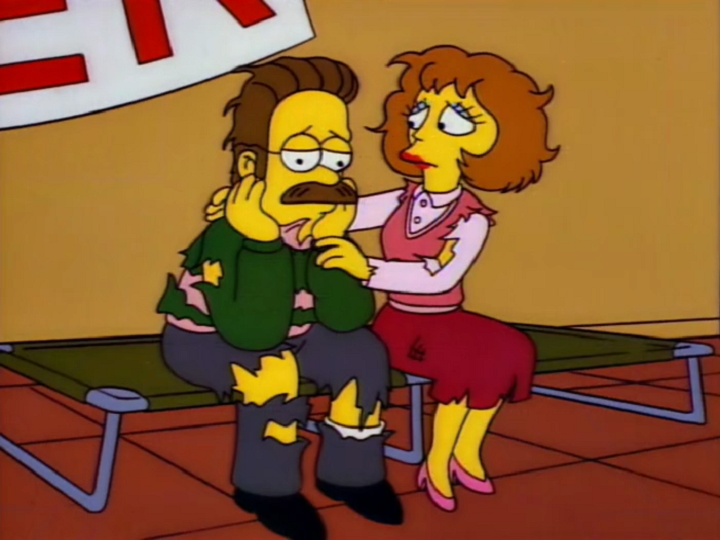 "Hurricane Neddy" is the eighth episode of season 8 and It originally aired on December 29, 1996. The episode was written by Steve Young and directed by Bob Anderson. Jon Lovitz guest stars as Jay Sherman. "After a hurricane blows through Springfield and destroys only Ned Flanders' home, Ned snaps after his friends and neighbors, including Homer crudely rebuild his house. He is checked into a psychiatric ward to discover the source of his sudden uncontrollable rage ever since his childhood." 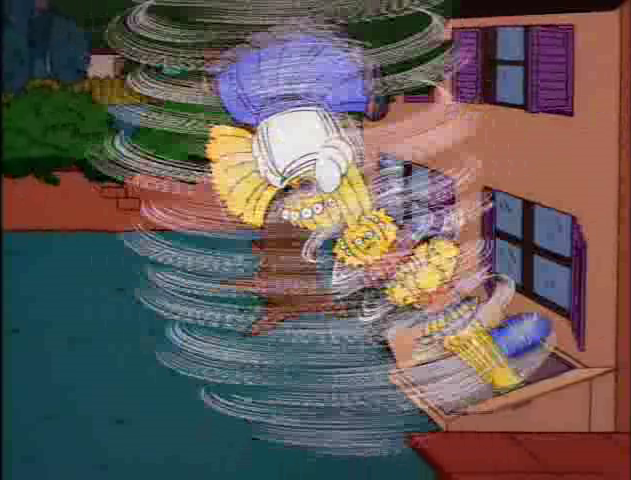 Homer thinks the hurricane is over, so he leaves the basement, but it's just the eye of the hurricane. The whole family tries pulling him back inside. Homer lazily enjoys his latest mid-afternoon nap outside when the winds begin to pick up. Lisa consults her weather instruments and a question-and-answer book and finds out a hurricane will soon strike Springfield. Panicked residents quickly gather supplies and food at the Kwik-E-Mart, but Ned remains calm as the main storm approaches, having fitted his home with a large tent-like guard to keep it hunkered down. As the bad weather hits, and various hurricane-related gags play out throughout Springfield, the Simpsons do their best at family bonding in the basement. The storm finally passes, and everyone is overjoyed that the hurricane caused absolutely no damage to their home, or seemingly anyone elses. However, the Flanders family is not so lucky - Ned's house is the only one that has been totally destroyed. Ned is relieved that his family escaped serious injury, but that's of little solace since he does not have homeowner's insurance (having considered insurance "gambling"). The Flanders family is forced to move into the church basement. There, he watches news accounts of the storm's aftermath, and is further discouraged when footage is shown of the Leftorium, cleaned out by looters. Seeking answers from God, Maude and Rev. Lovejoy attempt to reassure Ned things will work out fine. He tries to find solace in the Bible, but all he gets is a paper cut. He tries asking God directly why he's being punished when he's done everything the Bible said (even the stuff that contradicts the other stuff) but gets no answer. The next day, in an attempt to show their community spirit and friendship, Marge commissions everyone in Springfield to rebuild the Flanders' home. The job is completed in record time, and Ned is overjoyed - that is, until he inspects their workmanship, which turns out to be (at best) shoddy; for example, some of the floor is made of dirt, there's too much electricity in the living room, the toilet's in the kitchen, there is a lot of loose nails sticking out in the walls, there is a crack in the kids' bedroom with a scary clown poster that frightens Rod and Todd and the door to the main bedroom is only large enough to accommodate a cat at best and even Barney is able to fit in the main bedroom with the small door and Ned says that he has seen enough. After leaving the rebuilt Flanders' home with Homer asking Ned of what does he think of the house that love built, the makeshift house soon crumbles, and Ned, who knows that everyone, including Homer tried their best, tries to calm down by containing his anger, but unfortunately he is unable to control his emotions and his temper explodes. He angrily speaks his mind about everyone's efforts which shocks the entire crowd, then rants on about specific residents, such as Marge (for always overlooking the negative by staying annoyingly positive after she told Ned that they meant well and everyone tried their best to rebuild his house), Bart (for thinking he is so cool all the time and mocking his catchphrases at him after Bart stood up for Marge and told Ned to back off before Ned shocks the entire crowd again, which Bart replies to becoming shocked and appalled), Lisa (for constantly talking and butting in after she informed Ned that Bart did nothing wrong), Chief Wiggum (for being a lousy cop after he laughed about Ned's insult at Homer's family), Krusty (for not being funny all the time after he heard about Ned's insult at Chief Wiggum and Krusty ignores him as he is taking notes for his act), Lenny (no reason since he does not know him but assumed that he is a jerk, even though he has only been here a few minutes and has no idea of what's going on), Moe (for being ugly and hate-filled and Moe replies to Ned by saying that he may be ugly and hate-filled, but he forgets the rest of what Ned has said) and Milhouse (for staring and how he looks after Ned passes by Milhouse and Milhouse replies to Ned that he wears glasses too) and ending his tirade by calling his neighbor, Homer "the worst human being I have ever met!" in a quiet voice. Homer then states, "Hey, I got off pretty easy." Ned then angrily drives away as the townspeople of Springfield, including the rest of the Simpsons and his family, except for Homer and Krusty become shocked of what Ned has said to them. Fearing he has lost his mind and on the verge of a mental breakdown, Ned checks himself into the Calmwood Mental Hospital to seek therapy. There, he is treated by his childhood psychiatrist, Dr. Foster, who reminds Ned that – because his beatnik parents did not believe in discipline – he was a rambunctious, out-of-control child in need of psychiatric counseling. That therapy, called the University of Minnesota Spankalogical Protocol, involved eight months of continuous spanking. There is a goof error however, since Dr. Foster says that the therapy happened around "30 years ago", but since Ned is now 60, he should have been around 30 at the time. Although it reformed Ned from his bratty behavior, it rendered him unable to express any anger at all and resulted in his trademark nonsensical jabbering at moments when he was particularly close to losing his temper. This caused Ned to unknowingly repress his anger, until it built up inside him and erupted in his tirade of insults at the townspeople, including his neighbor, Homer. Dr. Foster, now having seen that his earlier therapy was inappropriate, enlists Homer to help Ned learn to appropriately express his emotions, as Homer is the person Ned harbors particularly resentful feelings towards. After several flubbed tries with pre-written cards by the doctors, Homer tries his own approach by saying Ned is afraid to be human, because humans hate things but he likes everything. Ned denies this before getting worked up over what he hates about the post office, then casually saying he hates his parents - suddenly he feels like a weight has been lifted from his shoulders. Dr. Foster then declares Ned cured. Shortly thereafter, The newly-cured Ned is released from Calmwood, and the townspeople of Springfield, including the rest of the Simpsons and his family greet him again and tells everyone that he is all better now and also tells them that he'll try harder at expressing his feelings and letting them know when he is upset, such as when he's really angry "I'm gonna run you down with my car" as long as they will hear about it. Everything then returns to normal and Homer tells Ned he's crazy as they both laugh. Wikisimpsons has a collection of images related to "Hurricane Neddy". Modified on January 20, 2019, at 20:26.